It was a Black Friday Buccaneer Bonanza in Flint Friday night. Two former Flint Beecher Bucs, Tez Thomas and Tommie Johnson, led the Mott Community College Bears to an 80-68 win over Sinclair (Ohio). The pair connected on five triples in the game, scoring 13 and 10 points, respectively. Mott led by as many as 19 midway through the second half on a Thomas basket in the lane. From there, the Bears weathered a couple flurries from Sinclair late, and cruised to victory in front of another large home crowd. As has become a habit early in the season, Friday night was a total team effort for Mott. All but one player on Mott’s roster scored in the game. Freshman forward Rod Milton led the team with 15 points and eight rebounds. Sophomore Darryl LeVert added 14 points and 10 rebounds. Mott head coach Steve Schmidt made wholesale changes throughout the game, subbing out five for five to start both halves. Nine players played 15 or more minutes for the Bears. makes up for what it lacks in talent with resilience. Even so, Sinclair failed to box out on too many Mott misses leading to second chance points for the Bears. Mott won the rebounding battle 38-26, with Milton and LeVert leading the way. Manny Powell, Jr. led all scorers with 19 points. One major bright spot for Mott was the play of reserve guard Austin Daniels. The freshman logged 18 minutes and dished out seven assists with only one turnover. If he continues to defend and take care of the ball, he’ll play a lot of minutes on this team. The Bears don’t need him to score. The Bears are now 5-0 on the season and prepping for a brutal schedule in December. The Bears will square off against Owens twice, Lansing and Kalamazoo Valley on the road, and two home games versus Columbus State and Lakeland. If the Bears can make it through this stretch no worse than 4-2, it will be a great month heading into conference play. Next up is Owens on Wednesday night in Toledo. The Express, coached by former Mott assistant Dave Clarke, are 7-2 on the season. Mott is currently ranked no. 16, but should move up several spots when the next poll is released by the NJCAA. Almost one year ago to the day, Mott Community College went toe-to-toe with rival Lansing at their place. Mott missed a pair of free throws with the game tied, gave the ball back to Lansing and lived to regret it. Devlin Bell’s rebound and putback at the buzzer gave Lansing the victory, 83-81. Fast forward one year and one day, Mott was up one in the game’s final two seconds — this time in Flint. Lansing split from the stripe to tie the game at 81. That set the stage for the heroics of freshman guard Malik Young. After Darryl LeVert cleared the rebound, Young caught the ball and free-wheeled for about eight seconds before driving left and hitting a runner as the buzzer sounded. Another game, another 83-81 thriller. It was the culmination of a second half resurgence by the Bears highlighted by a pivotal three-pointer from freshman guard Amariontez Ivory-Thomas. Mott fell behind by as many as 10 points in the second half after trailing by six points at the half. The Bears’ superior depth proved to be the difference maker. Every player on Mott’s 11-man roster scored at least four points. Freshman guard Joseph Stamps led Mott (4-0) with 15 points and three assists. Young and Ivory-Thomas added 12 and 11 points, respectively. Lansing (2-3), by contrast, is top heavy. The team’s starters were responsible for 68 of the team’s 81 points. Javon Haines led all scorers with 20 points and eight rebounds. Tracy Edmond added 15 points, 10 rebounds and four assists. Mott head coach Steve Schmidt will never be disappointed in a win over Lansing. That said, Mott certainly has more to offer their hall of fame head coach on both ends of the floor. The Bears shot 39 percent from the floor and a paltry 20 percent from three-point range in the game. On the defensive end, the Bears surrendered 45 points in the first half and put the Stars on the foul line 42 times. That said, getting a win over a quality opponent without the ‘A’ game is reassuring. The smart money is on this team continuing to improve and, by the end of the year, being one of the top teams in the country at this level. Bear in mind this is a team without a single returning player from last season. Mott returns to action on Black Friday at home against Sinclair. The game tips at 7 p.m.
Mott freshman Justice Green soars for two in the second half against Northwood Wednesday night. 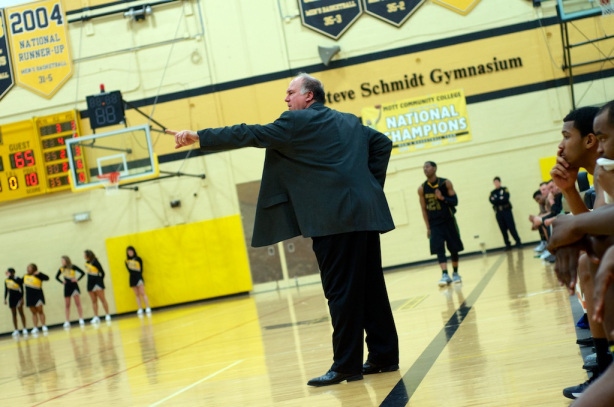 If any coach could come away angry from a totally lopsided victory, it’s Steve Schmidt. Mott’s Hall of Fame head coach has made a career out of turning good rosters into great teams with intensity and attention to detail. That said, Wednesday night’s game against Northwood’s JV team won’t make his scrapbook. Mott (3-0) was uninspired on the defensive end against a team that was overmatched at every position. The Bears surrendered twice as many points as warranted and sleepwalked to victory, 92-50.Mott shot a higher percentage from the field (60 percent) than from the foul line (53 percent). The Bears also turned the ball over 21 times. 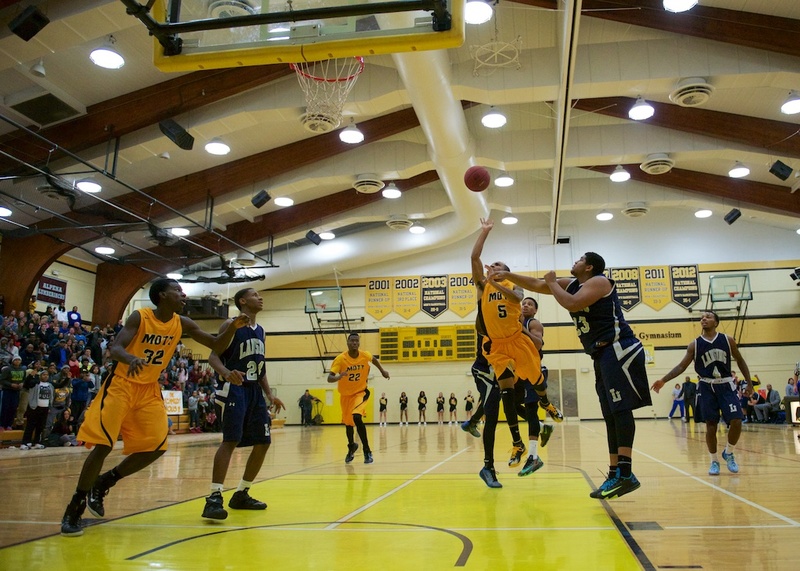 Daryl Bigham and Malik Young, both freshmen, led Mott with 18 and 17 points, respectively. Reserve freshmen Tommie Johnson added 11 points. Northwood JV, coached by former Delta College head coach Lonnie Griffin, shot 33 percent from the field. Billy Ames led Northwood with 11 points. Mott, now 3-0 on the season, has one respectable win over Kalamazoo Valley bookended by wins over JV teams. We will have a better idea of how good this team is when they meet up with Lansing next Friday night at home. 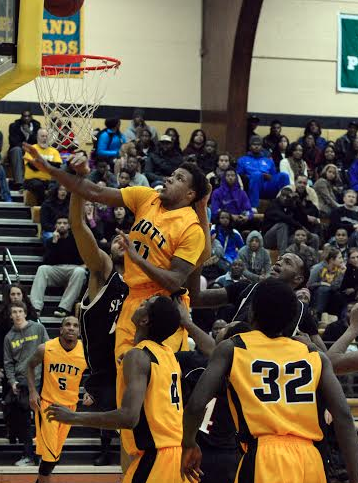 Mott Community College improved to 2-0 on the season Friday night with a win over Kalamazoo Valley, 84-74. The Bears were led by freshman forward Daryl Bigham, who scored 29 points with 12 rebounds. 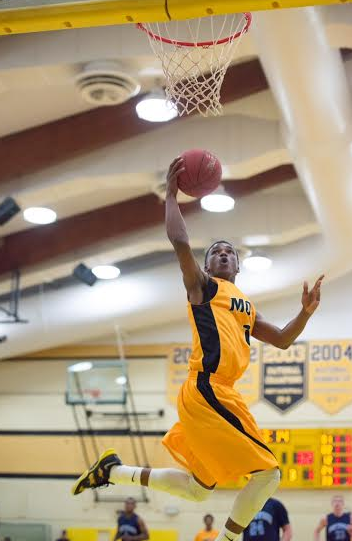 Freshman guard Joseph Stamps made his debut for Mott Friday night. He sat out the opener on Tuesday night with an injury. Stamps, one of the top guards in Chicago’s 2014 class, scored 11 points with three assists and three steals. Rod Milton added 12 points. Mott will return to action at 7:30 p.m. Wednesday at home against Northwood JV. FLINT, Michigan — It didn’t take long for basketball fans in Flint to familiarize themselves with the most intriguing prospect on Steve Schmidt’s roster of 11 fresh faces. The player formerly known as “Caris LeVert‘s brother,” it turns out, has his own name and his own game. Darryl LeVert, Mott’s 6-foot-7 power forward, was dominant at both ends of the floor on Tuesday night, as Mott clobbered Rochester College’s JV squad, 101-60. He scored nine points and pulled down eight rebounds in the first half leading the Bears in what turned out to be little more than a well-organized scrimmage. LeVert finished with 13 points on seven shots, 14 rebounds, three assists and three blocks in 21 minutes. Mott started the game on a 30-7 run punctuated by three consecutive baskets from Detroit freshman Daryl Bigham. Former Flint Northern and Beecher standout Tez Ivory-Thomas scored 12 points in the half including 2-for-3 from 3-point range to make the second half little more than a formality. Bigham finished with 10 points and six rebounds. Ivory-Thomas added 16 points and three assists. The second half played out like a full-fledged practice for Mott as Coach Schmidt made wholesale changes to his lineup, playing every active player on the roster. Mott’s leading scorer was Worcester, MA product Rod Milton, who scored 20 points on 11 shots with five boards. Milton plays above the rim and will put many in mind of former Mott small forward Ralph Eason. Milton passes the eyeball test. He looks like the real deal. Former Flint Southwestern standout guard Malik Young struggled at times tonight finishing at the rim, but showed the quickness that will make him a nightmare to defend this season. He scored 13 points on 3-for-9 shooting. Arguably Mott’s most-heralded prospect, former Chicago Curie guard Joseph Stamps, did not play due to an injury. Brenden Adams led Rochester with 13 points. Mott (1-0) will return to action at 7:30 p.m. at home on Friday night against Kalamazoo Valley.